"Valley of the Sun" redirects here. For the 1942 Western, see Valley of the Sun (film). For other uses, see Sun Valley (disambiguation). 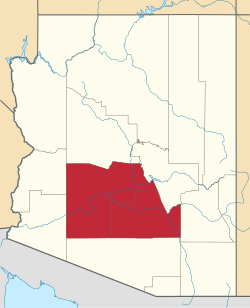 The Phoenix Metropolitan Area highlighted in a map of Arizona. The Phoenix Metropolitan Area – often referred to as the Valley of the Sun, the Salt River Valley, or Metro Phoenix – is a metropolitan area, centered on the city of Phoenix, that includes much of the central part of the U.S. State of Arizona. The United States Office of Management and Budget designates the area as the Phoenix-Mesa-Scottsdale Metropolitan Statistical Area (MSA), defining it as Maricopa and Pinal counties. As of the Census Bureau's 2017 population estimates, Metro Phoenix had 4,737,270 residents, making it the 11th largest Metropolitan Area in the nation by population. The gross domestic product of the Phoenix Metropolitan Area was $242 billion in 2017, 16th largest amongst metro areas in the United States. It is also one of the fastest growing major metropolitan areas, gaining nearly 600,000 residents from 2010 to 2017, and nearly 1.4 million since 2000. The population of the Phoenix Metropolitan Area increased by 45.3% from 1990 through 2000, compared to the average United States rate of 13.2%, helping to make Arizona the second fastest growing state in the nation in the 1990s (the fastest was Nevada). The 2000 Census reported the population of the metropolitan area to be 3,251,876. As for the 2010 Census, the two-county metropolitan area was reported to have a population of 4,192,887. Metro Phoenix grew by 941,011 people from April 2000 to April 2010, making it one of the fastest growing metro areas in the country. This also contributed to the entire state's exceptional growth, as the area is home to just over two-thirds of Arizona's population. 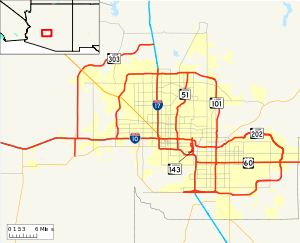 Map showing cities and highways in the Phoenix–Mesa–Chandler MSA, as defined by the U.S. Census as both Maricopa and Pinal counties. As of 2010, the Phoenix Metropolitan area consists of Maricopa and Pinal counties, comprising a total area of about 14,600 square miles. Because of the size of counties in Arizona, even though Maricopa and Pinal counties together contain nearly 4.5 million people, most of the area is uninhabited, which gives the MSA an extremely low density compared to other major MSAs in the nation. The average elevation in the City itself is about 1,100 feet (340 m), with the highest point being in South Mountain Park Preserve 2,704 feet (824 m).The highest point in the two county area is 7,657 feet (2,334 m) in the Four Peaks mountain range. Below is a chart showing climate data collected from Sky Harbor Airport. Note that due to the vast area covered by the MSA, climates differ throughout the valley. Many new freeways are planned to be built in the future, either through upgrades of existing roads such as SR 74, SR 85, and Northern Parkway; or through the construction of new freeways where no road existed before such as SR 24, SR 30, I-11, and the South Mountain Freeway portion of Loop 202. 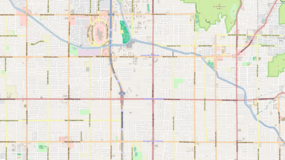 Most of the arterial roads in the Phoenix metropolitan area are laid out on a regular grid, following the section lines established in the Public Land Survey System. As a result, arterial roads in cities that had once been geographically separate may have been given different names while occupying the same section line. When these roads were extended to accommodate the growth in the area they eventually merged into a single road while the previous segments retained their existing names. This results in several cases of a road abruptly changing names; for example, Dunlap Avenue in Phoenix becomes Olive Avenue west of 43rd Avenue, in Glendale. Another quirk of a grid system based upon the Public Land Survey System is due to the occasional corrections in the grid caused by the curvature of the earth. This results in arterial roadways deviating slightly from a straight line, as can be seen in many locations where roads abruptly curve either just north or just south of Baseline Road to follow a new section line. 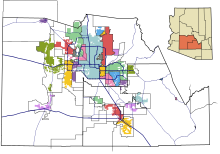 The majority of the cities in the metropolitan area, as well as unincorporated areas in Maricopa County, observe the addressing system employed by the City of Phoenix. A number of cities, however, retain their own addressing systems with differing reference points, creating the potential for multiple instances of a house number being found on the same named road. In terms of numbering systems, some roads that continue through multiple cities will switch numbering conventions several times. Broadway Road, for example, starts and stops multiple times, passing through Goodyear, Avondale, Phoenix, Tempe, Mesa, and Apache Junction, each with their own reference point for address numbering. Though the street does not curve, the direction changes from west to east in each city and back again when moving from one city to the next, causing considerable overlap in numbers. This has been a source of confusion for some newcomers, who might end up, for example, at 91st Avenue and Thunderbird Road, when in fact they intended to go to 91st Street and Thunderbird Road, between 30 minutes and an hour away from one another depending on traffic. One beneficial quality of this arrangement for unfamiliar travelers is that the major north-south arterial roads are rarely similarly named; the "avenue" arterials in the West Valley are all odd-numbered and the "street" arterials in the East Valley are even-numbered, with the exception of 7th Ave. & 7th St., both being major roadways running parallel and each one-half mile from Central Ave.
Amtrak serves the Phoenix metropolitan area with their Sunset Limited and Texas Eagle trains—both of which stop in Maricopa, located about 40 miles south of downtown Phoenix. Amtrak's Stagecoach Express provides Thruway Motorcoach service from Maricopa station to both Phoenix Sky Harbor International Airport and Tempe station. Amtrak also provides additional Thruway Motorcoach service from Phoenix Sky Harbor International Airport to Flagstaff station, which is served by the Southwest Chief. Amtrak's Los Angeles-New Orleans Sunset Limited served the city of Phoenix directly from 1971 until it was rerouted on June 2, 1996, to a more southerly route between Tucson and Yuma, Arizona, in order to accommodate the Union Pacific Railroad's desire to abandon a portion of its Phoenix-to-Yuma "West Line." This made Phoenix one of the largest cities in the nation without direct passenger service. A light rail system (dubbed the "METRO Light Rail") runs more than 20 miles from suburban Mesa, through Tempe and into Phoenix, traveling through the downtown area, offering access to Phoenix Sky Harbor International Airport and linking two of the four metro area campuses of Arizona State University. The light rail began public operation on December 27, 2008, and it was projected to initially accommodate 26,000 boardings a day, or more than 8 million boardings in its first year. The Valley Metro Rail boardings has experienced constant growth since the beginning. In the year 2012, the light rail boarded just over 14 million people. Many expansions to the METRO system are currently in the early planning stages, and two are under construction. The Central Mesa extension project, which extends the Main Street line 2½ miles from its current terminus at Sycamore to Mesa Drive in Downtown Mesa, has finished construction and opened on August 22, 2015. The Northwest rail project opened March 2016. The project extended the 19th Avenue track from its former terminus at Montebello Ave to Dunlap Avenue, 3 miles north. Many more extensions are funded, with further projects being studied for feasibility. In 2010, Phoenix Sky Harbor International Airport was the 24th busiest passenger facility in the world and the 10th busiest in the United States, with more than 38 million passengers using the facility. With three terminal buildings encompassing 120 gates, more than 20 airlines offer daily non-stop flights to destinations throughout the world. The Phoenix-Mesa Gateway Airport started commercial passenger flights in 2004. The airport currently provides service to 39 destinations. There are several municipal and regional airports in the metropolitan area; however, none of them are currently used by commercial airlines for passenger flights. They include, but are not limited to, Glendale Airport, Phoenix Deer Valley Airport, Phoenix Goodyear Airport, Scottsdale Airport, Falcon Field, Chandler Municipal Airport, Buckeye Airport, Phoenix Regional Airport, Pleasant Valley Airport, Estrella Sailport, Stellar Airpark, Skyranch at Carefree, Gila River Memorial Airport, Pegasus Airpark. ^ The Comfort Index uses a combination of afternoon summer temperature and humidity to closely predict the effect that the humidity will have on people. Higher values indicate a more comfortable climate. ^ "Phoenix-Mesa-Scottsdale Metro Area, Arizona People". www.bestplaces.net. ^ "Phoenix-Mesa-Scottsdale Metro Area, Arizona: 155 Zip Codes". bestplaces.net. ^ "INCOME IN THE PAST 12 MONTHS (IN 2016 INFLATION-ADJUSTED DOLLARS)". American Fact Finder. US Census Bureau. Retrieved 2018-03-21. ^ "POVERTY STATUS IN THE PAST 12 MONTHS". American Fact Finder. US Census Bureau. Retrieved 2018-03-21. ^ "Phoenix-Mesa-Scottsdale Metro Area, Arizona Climate". www.bestplaces.net. ^ "NowData - NOAA Online Weather Data". National Oceanic and Atmospheric Administration. Retrieved 22 March 2018. ^ "Station Name: AZ Phoenix Sky Harbor INTL AP". National Oceanic and Atmospheric Administration. Retrieved 22 March 2018. ^ "WMO Climate Normals for PHOENIX/SKY HARBOR INTL, AZ 1961–1990". National Oceanic and Atmospheric Administration. Retrieved 23 March 2018. ^ "Monthly Averages for Phoenix, AZ – Temperature and Precipitation". The Weather Channel. Retrieved 2009-05-07. ^ "Phoenix: Economy - Major Industries and Commercial Activity". www.city-data.com. ^ "Arizona Republic 100: State's largest employers". ^ "Phoenix-Mesa-Scottsdale Metro Area, Arizona Economy". www.bestplaces.net. ^ Phoenix Metropolitan Street Atlas (2006 ed.). Wide World of Maps. 2006. ^ "Google Maps". Google. January 1, 1970. Retrieved October 31, 2011. ^ 56 S 111th Pl (January 1, 1970). "56 S 111 pl, Mesa, Maricopa, Arizona 85208 – Google Maps". Google. Retrieved October 31, 2011. ^ "Providing Public Transportation Alternatives for the Greater Phoenix Metro Area". www.valleymetro.org. ^ "Providing Public Transportation Alternatives for the Greater Phoenix Metro Area - Valley Metro". www.valleymetro.org. "Phoenix metro population growth figures". Greater Phoenix Economic Council. Archived from the original on July 17, 2007.